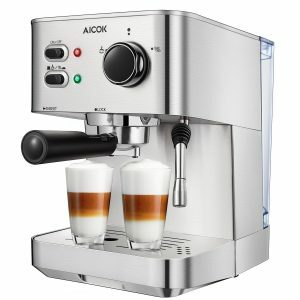 Aicok CM4682 is a stainless steel 15 bar semi-automatic coffee machine that makes espresso, latte, and cappuccino and that includes an independent milk frother. It first appeared on Amazon.com at the end of January 2017 and there are only a few customer reviews at the moment, but scores 5 out of 5 stars. 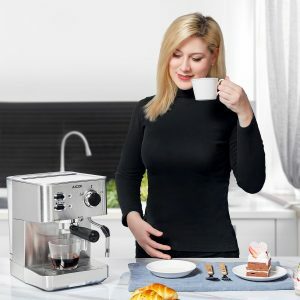 You can brew different types of coffee with this brand new coffee maker, like the latte, cappuccino, mocha, espresso and the end result is great. The taste and texture are reported to be very good- no different to what you’d get from the coffee shop. Coffee oil is extracted successfully and the taste of coffee is rich so you will enjoy your cup of coffee more, thanks to its 15-bar pump high-pressure design. It is easy to operate overall and makes coffee pretty quickly in a couple of minutes or less. The detachable water reservoir has a 43 ounce or 1.25-liter capacity, letting you make a few cups before you need to fill it in. You need to be sure there is enough water in the water reservoir before attempting to make coffee with this machine. And once you’re done with making your coffee, please turn off the power button and just unplug the power cord. Aicok Coffee Maker weighs 12.2 pounds and measures 11 x 8 x 11.5 inches. It has a beautiful modern design with full stainless steel and no plastic parts except for a couple of externals like the drip tray and the button. The 1050-watt motor (120V) is powerful and runs relatively quietly- makes a bit of noise and the 26-inch long cord is not bad. With its pretty design and compact size, it can have a permanent spot on your kitchen counter as it won’t occupy that much space. You can brew one or two espressos at a single time with the heavy-duty dual spout espresso filter that is easy to use even by beginners. Anyone at any coffee making skill level will be able to make barista-quality espresso. You’ll see a red Power indicator next to the Power On/Off button and a green Ready indicator next to the Coffee/Steam switch. You can steam and froth the milk with the swiveling steam wand. You just align the lock and put the filter into the funnel and put your cups on the removable drip tray that makes it easier to clean. The stainless steel filter inside the funnel can be cleaned in the dishwasher but not the funnel itself. Please make sure you brew some water on its own to clean the reservoir before using it for the first time or if you have not used it for a long time. If you don’t want your coffee to have a harsh and strong taste please make sure the boiler is not too hot- cooled down after frothing your milk. And the reason the coffee you brewed has a weak taste is either because there is not enough coffee in the sieve or the coffee is too coarse. The taste of coffee is very good and the fact that you can make different types of coffee and with milk foam is great. So you will not have to go down to a coffee shop every morning to get a great tasting coffee. It is offered with a decent 24 months warranty and a lifetime support from a friendly customer support team.